Your customers look on-line to find products and services. Connect with your customers with a powerful and professional website. Your customers will be viewing your website from smartphones and tablets, as well as from laptops and desktops. We specialize in making websites that look great on all types of devices. Our websites work on iOS and Android, smartphones and tablets. We know that owners of small businesses have to do it all. We can be your IT department and help you with other technical needs you may have, like optimizing your social networking accounts or creating photo or video content. 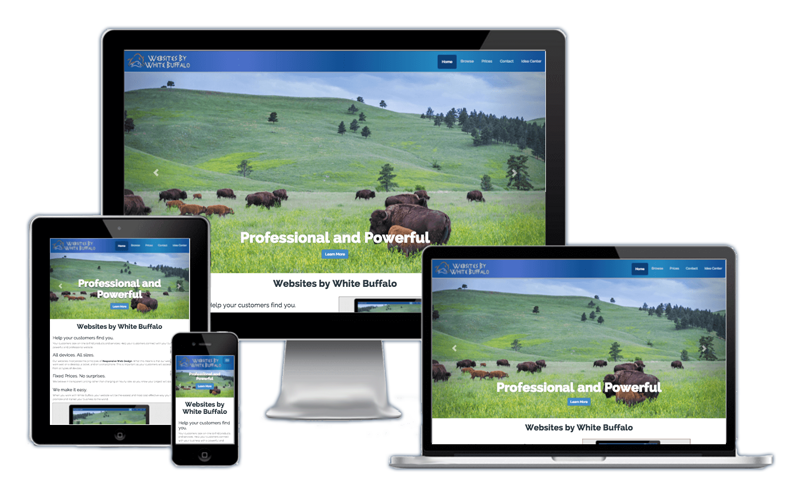 When you work with White Buffalo, your website will be the easiest and most cost effective way you have to promote and market your business to the world. Our standard websites are built with PHP using Twitter Bootstrap and jQuery. This is your most cost effective option and will give you the most design flexibility. Choose a WordPress website if you would like to add your own content to the website. We will train you how to use WordPress. White Buffalo uses WordPress WooCommerce for our shopping websites. Our research has shown it to be the best and lowest cost in the market.